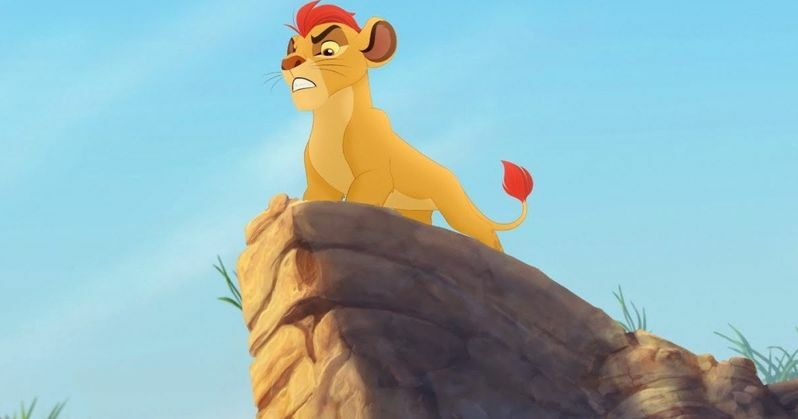 The epic storytelling of Disney's The Lion King continues with The Lion Guard: Return of the Roar, a primetime television movie event premiering in November on Disney Channel. The movie follows Kion, the second-born cub of Simba and Nala, as he assumes the role of leader of the Lion Guard, a team of animals tasked with preserving the Pride Lands. The movie is a precursor to The Lion Guard television series, premiering in early 2016 on Disney Channels and Disney Junior channels around the globe. A special preview of The Lion Guard: Return of the Roar will be presented at Disney's D23 Expo in Anaheim, California, on Sunday, August 16 (2:00 p.m.), but today Disney Jr. has released the first clip from this TV movie, and revealed the full voice cast. James Earl Jones and Ernie Sabella reprise their roles from The Lion King as Mufasa and Pumbaa, respectively, alongside Rob Lowe (The Grinder) as Simba and Gabrielle Union (Being Mary Jane) as Nala. Max Charles (The Strain) stars as Kion. The voice cast also includes Joshua Rush (The Adventures of Puss in Boots) as Kion's best friend, Bunga, a fearless honey badger; Atticus Shaffer (The Middle) as Ono, an intellectual egret; Diamond White (Sofia the First) as Fuli, a confident cheetah; and Dusan Brown (Blaze and the Monster Machines) as Beshte, a friendly and good-spirited hippo. Set in the African Savanna, The Lion Guard: Return of the Roar follows Kion as he assembles the members of the Lion Guard. While traditionally the Lion Guard has been comprised of lions known to be the fiercest, bravest, fastest, strongest and keenest of sight in the Pride Lands, Kion breaks tradition by instead calling upon some of his friends who he believes best exemplify these heroic qualities. Throughout the movie and the series, the diverse team of young animals will learn how to utilize each of their unique abilities to solve problems and accomplish tasks to maintain balance within the Circle of Life, while also introducing young viewers to the vast array of animals that populate the prodigious African landscape. The Education and Science experts at Disney's Animal Kingdom theme park serve as consultants, advising on the characteristics, behaviors and habitats of the African animal species featured and inspiring original stories based on their first hand experiences. Ford Riley (Special Agent Oso) developed the movie and series and serves as executive producer. Howy Parkins (Jake and the Never Land Pirates) is the director. Christopher Willis (Mickey Mouse) is the composer, and Beau Black (Miles from Tomorrowland) is singer/songwriter. Author and Swahili expert Sarah Mirza is the language and cultural advisor. Additional cast members include Eden Riegel (All My Children) as Kiara, Sarah Hyland (Modern Family) as Tiifu, Madison Pettis as Zuri and Jeff Bennett as Zazu (both from Jake and the Never Land Pirates); Andrew Kishino (Star Wars: The Clone Wars) as Janja, Vargus Mason (Sofia the First) as Cheezi, Greg Ellis (Star Wars Rebels) as Mzingo, Khary Payton (Teen Titans) as Rafiki, and Kevin Schon (The Lion King's Timon and Pumbaa) as Chungu and Timon. The Lion Guard: Return of the Roar is a production of Disney Television Animation. Take a look at the first clip from this TV movie, which shows how Simba's son Kion is already just as powerful as his father.